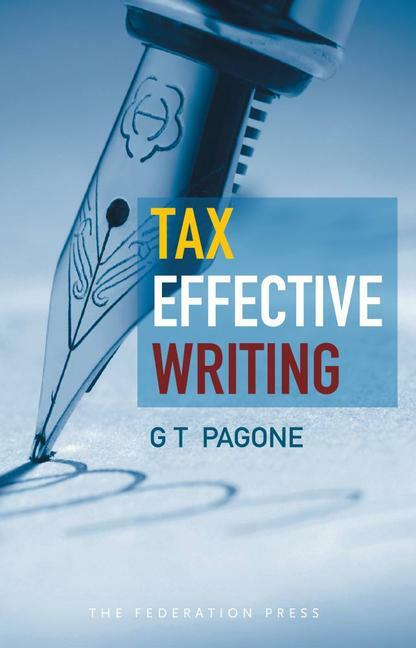 This book is for the tax practitioner who needs to be effective when writing. It identifies the key laws, rules and expectations which affect the form and content of the main documents tax practitioners need to write. Tax Effective Writing aims to show how the tax practitioner can write those documents in a way that satisfies the relevant laws, rules and expectations at the same time as being effective in persuading, explaining or producing the desired tax effect. Tony Pagone is a Judge on the Supreme Court of Victoria. He was previously a practising barrister with a wide tax and commercial practice throughout Australia. He was frequently briefed to appear or advise taxpayers and the Commissioner of Taxation alike and has appeared in many of the leading cases on the tax avoidance provisions. Tony has also held significant positions within the tax profession as President of the Tax Bar Association, Chairman of the Business Law Section of the Law Council of Australia and Professorial Fellow in the Law Faculty at the University of Melbourne where he has taught on the tax avoidance provisions for many years. He also held the position as special counsel to the Commissioner of Taxation.